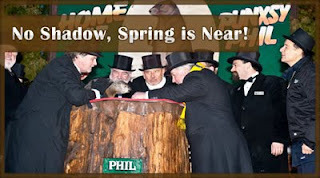 The Punxsutawney Groundhog (picture is from the official website at http://www.groundhog.org/) thinks spring will be here soon. But some Westerners don't think it will be soon. In less than a month the community will begin gathering weekly and working the garden. I am yearning for fresh grown veggies!